Super 8 Inglewood/LAX is a comfortable hotel located just minutes away from all of LA’s top attractions, and just a short drive from the LAX airport. With its close proximity to fun activities for the whole family, comprehensive range of amenities, and 24-hour airport shuttle service, this hotel is the smart choice for families looking to create lots of fun new memories. As soon as you walk into the hotel, you’re greeted by its warm and friendly staff. An attractive feature of the hotel is that children under 17 stay free with an adult, letting you save those travel dollars for the attractions you plan to visit. Parking is also free, and the hotel features a convenient Park and Fly package, with 24-hour airport shuttle service for $10, plus $5 for each additional passenger. The Super 8 Inglewood/LAX features three main room options. For the smaller travel party, a double-occupancy room complete with Queen-sized bed lets you kick up your feet and relax in comfort, before planning the rest of your vacation. A deluxe option comes with an in-suite Jacuzzi, perfect for couples and newlyweds. Families can unwind after a long day of play in one of the hotel’s quadruple-occupancy rooms with two Queen-sized beds. Each room comes with complimentary air conditioning, cable TV, Wi-Fi internet, microwave, refrigerator, and coffee maker. Parents will be delighted to know that the hotel also features complimentary 8-item Superstart Breakfast, so you can start your day’s adventures the right way. Hotel guests will no doubt have seen the many signs of LA’s local attractions when pulling into the hotel. These include the iconic Disneyland, the horse races at Hollywood Park, and the always vibrant Hollywood Park Casino, to name just a few. No matter how you intend to spend your vacation, the City of Angels will guarantee that you never have a dull moment. If you intend to travel a little further afield, know that the LA area is widely regarded as America’s Playground. The city itself is home to numerous historic sites, including Hollywood and the Sunset Strip, just a short drive away. Experience the breathtaking vistas of LA’s 75 miles of coastline, known for its famous beaches such as Malibu and Venice Beach. For the adventure-oriented, LA sports an extensive system of hiking, cycling, and off-road trails that will keep you at the edge of your seat year-round. Skiing and snowboarding can also be found a short hours away. Or, knock out a few drives at one of the city’s 19 golf courses. And when you get famished, the hotel is just steps away from dining options that will please the entire family. Fast-food mainstays such as Jack In the Box and Taco Bell are right next door, and casual dining options like Red Lobster and Chili’s Grill & Bar are right around the corner. Numerous five-star, internationally-regarded restaurants are all just steps away. Whether you’re planning a romantic getaway for two to take in the sights and sounds of LA’s bustling nightlife, or an adrenaline-filled week of riding roller coasters and water slides, the Super 8 Inglewood/LAX should make the top of your list. With its full suite of convenient amenities, excellent staff, and comfy rooms, you definitely won’t regret it. 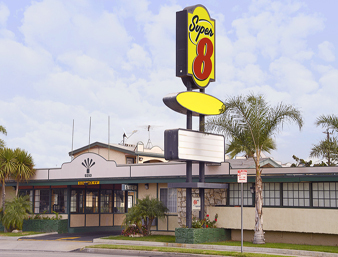 Super 8 Inglewood/LAX is a comfortable hotel located just minutes away from all of LA's top attractions, and just a short drive from the LAX airport.